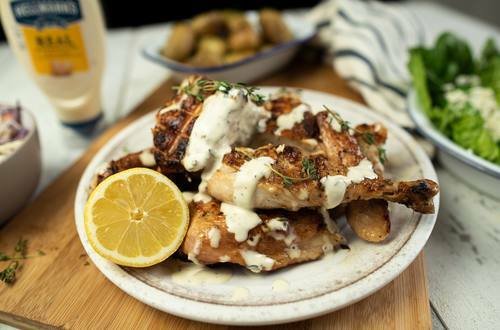 A perfect summer recipe for foolproof BBQ chicken; finished with a bright & fresh lemon mayonnaise. 1 Prepare your BBQ to cook at a medium heat. Lay the orange and lemon slices in a single layer on in the BBQ cage and place the rosemary sprigs on top. Spatchcock the chicken by cutting along one side of the spine and layout flat in the cage. Close the cage and place on the BBQ. 2 Fill a jug with 400ml of water and add the juice of one lemon and a pinch of sea salt. Stir until salt is dissolved and place it in the spray bottle. Regularly turn the chicken and spray with lemon-salt water with every turn. Cook for 40 mins until chicken is cooked through. Remove from the BBQ and rest for 10 mins. 3 Place the Hellmann’s Real Mayonnaise, olive oil, thyme, the juice of half a lemon and a pinch of black pepper in a bowl. Mix well, spoon the dressing over your cooked chicken and serve.